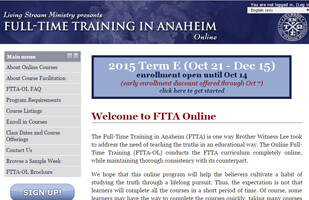 The Full-Time Training in Anaheim (FTTA) is one way Brother Lee took to address the need of teaching the truths in an educational way. The Online Full-Time Training (FTTA-OL) conducts the FTTA curriculum completely online, while maintaining thorough consistency with its counterpart. Online learning requires active interaction with the materials, deliberate written responses, and participation from every learner. Additionally, it permits quality feedback for each learner while providing tightly controlled, high-quality instruction. 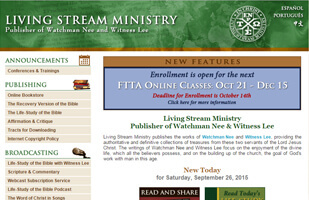 Living Stream Ministry is a non-profit corporation that is primarily dedicated to the publication of the ministry of Watchman Nee and Witness Lee. Living Stream Ministry has one goal: to supply spiritual food for the nourishment of all believers that they may grow in the divine life for the sake of the building up of the Body of Christ. 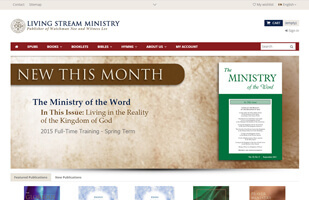 Living Stream Ministry provides the complete text of many of its ministry publications online in the hope that the riches of Christ can be broadly sown throughout the earth for the benefit of all the Lord’s children. 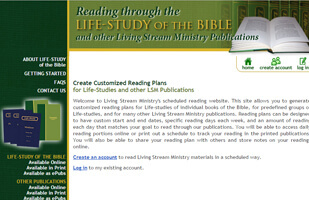 This site allows you to generate customized reading plans for Life-studies of individual books of the Bible, for predefined groups of Life-studies, and for many other Living Stream Ministry publications. 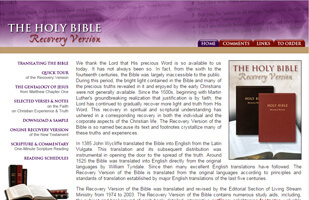 The Recovery Version of the Bible contains numerous study aids, including, the subject and background of each book; detailed, interpretive outlines; enlightening footnotes, valuable cross-references, and a variety of useful charts and maps. 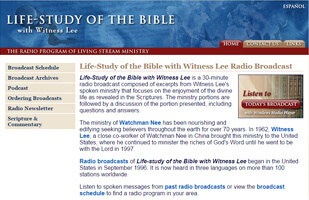 Life-Study of the Bible is a 30-minute radio broadcast composed of excerpts from Witness Lee’s spoken ministry that focuses on the enjoyment of the divine life as revealed in the Scriptures. The ministry portions are followed by a discussion of the portion presented, including questions and answers. eManna delivers the Word of God as the bread of life daily via email. With a few verses from the Bible and a short word of ministry, eManna will nourish and strengthen your faith. This service is free. Living Stream Ministry provides a subscription webcast service that enables subscribers to access the video content of recent conferences and also selected conferences and video trainings by Witness Lee. 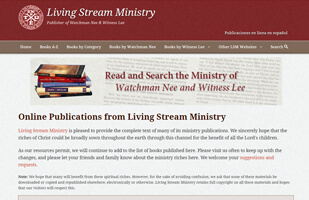 Living Stream Ministry publishes the works of Watchman Nee and Witness Lee, providing the authoritative and definitive collections of treasures from these two servants of the Lord Jesus Christ. Their writings focus on the enjoyment of the divine life, which all the believers possess, and on the building up of the church, the goal of God's work with man in this age.